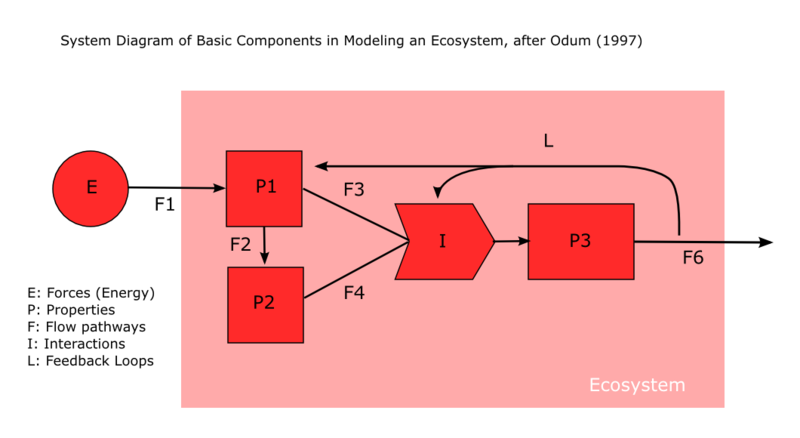 How might 'ecologies' and 'ecosystems' apply to project design and management? Sir Arthur Tansley (1871-1955) was an english botantist, who in 1935, coined the term 'ecosystem' for the biotic and abiotic components that made a whole. “the idea of progress towards equilibrium, which is never, perhaps, completely attained, but to which approximation is made whenever the factors at work are constant and stable for long enough period of time”. 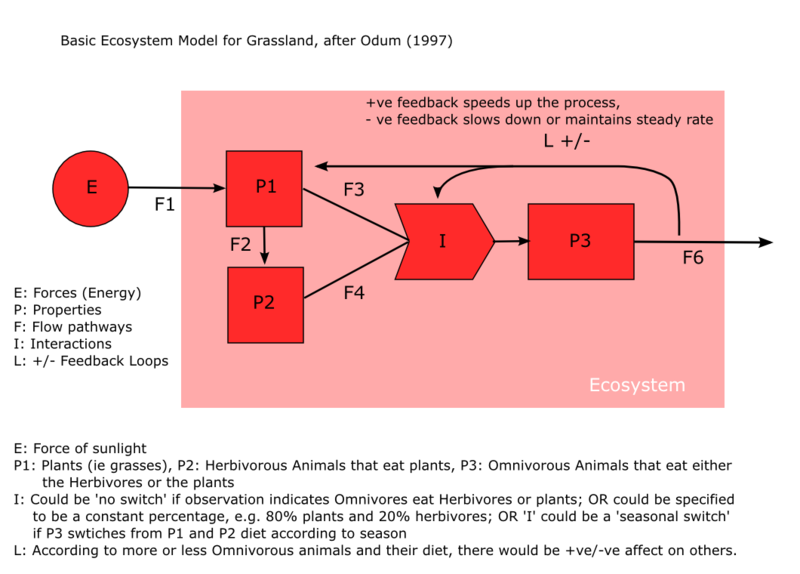 Recent development of term … Ecosystem management: set up from trying to deal with the components seperately, to managing the system as a whole. 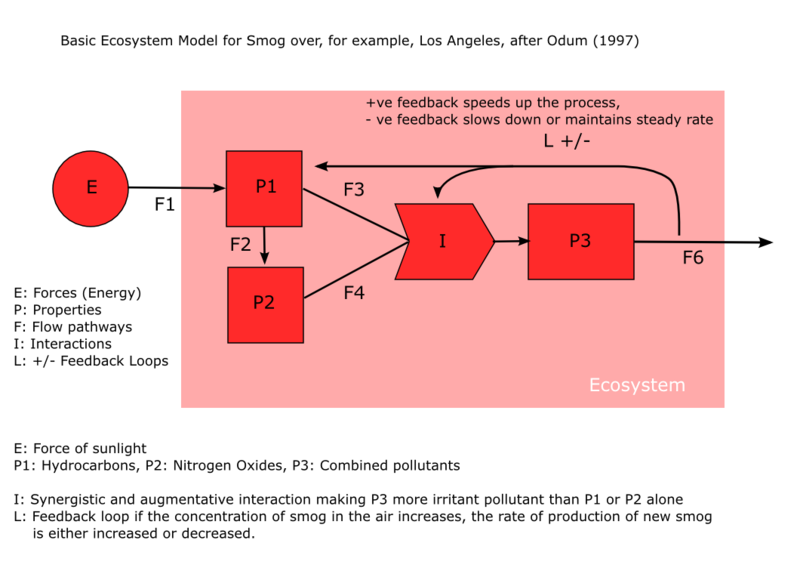 Odum, E. P. (1997), Ecology: A bridge between Science and Society. Sinauer Associates Publishers, Sunderland, Mass., USA. Geological, biological and ecological hierarchies are 'nested' in each level made up of lower-level units. (In comparison human-organised hierarchies in governments, military, corporations, universities are 'non-nested': Sergeants, for example, are not composed of groups of privates). In ecology the term population, originally coined to denote a group of people, is broadened to include groups of individuals of any species that live together in some designated area. Community, in ecology, is used in the sense of the biotic community, to include all of the populations living in a designated area. The community (biotic) and the non-living environment (abiotic: stones, minerals) functioning together as an ecological system or ecosystem. The major continents and oceans are the biogeographic regions, each with its own special flora and fauna. The Biosphere (synonymous with ecosphere) is widely used to refer to all of Earth's ecosystems functioning together on a global environmental scale. Ecosphere = all the life and interacting non-living materials (all the ecosystems). Also lithosphere (rocks, sediments, mantle and core of earth), hydrosphere (surface and ground water) and atmosphere. Each level in the hierarchy influences what goes on at adjacent levals. Processes at lower levels are often constricted by those at a higher level. In otherwords large ecosystems as a whole , such as oceans or large forests, are less variable over time than their individual components. The challenge is to recognise the unique characteristics of the level selected and devise appropriate methods of study and/or action. Different tools are required for study at different levels. To get useful answers we must ask the right questions. A model is a simplified formulation that mimics a real-world phenomenon so that complex situations can be comprehended and predictions made. In their simplest form, models maybe verbal or graphic. 2. Forces (E; forcing functions) which are outside energy sources or casual forces that drive the system. Energy is a necessary input. The sun is the ultimate energy source for the biosphere and directly supports most natural ecosystems. Other energy sources may be important for many ecosystems, for example, wind, rain, water flow, fuel. Energy also flows out of the system in the form of heat and in other transformed or processed forms such as organic matter (for example food and waste products) and pollutants. Water, air, and nutrients necessary for life, along with all kinds of other materials, constantly enter and leave the ecosystem. And organisms and their popagules (seeds and reproductive stages) enter (immigrate) and leave (emigrate) the ecosystem. Ecosystems have 2 major biotic components. These organisms may be thought of as producers. Heterotrophic: (other-nourishing) component which utilises, rearranges, and decomposes the complex materials synthesised by the autotrophs. Fungi, non-photosynthetic bacteria, micro-organisms, animals , including humans, are these. “brown belt” of soil and sediment below the green canopy. These organisms may be thought of as consumers, as they are unable to produce their own food and must be able to obtain it by consuming other organisms. When Autotrophic and Heterotrophic organisms are linked together in a network of energy transfers, it is called a food web. This is one which can be explored, unpacked, with the attempt to describe it as an ecosystem. It can involve applying words and concepts from one context to another, and transforming meanings. It can involve detailing all aspects of the project. It can involve detailing the 'populations' in the project that make up the community. It can involve detailing the project and the artifacts produced within it. It can involve detailing the forces and energies applied between all of the above. It can involve imagining where the project's 'landscape' and 'region' is. It can involve imagining how the project might be developed or extended. It can involve imagining its sustainability or life-span. It can involve thinking about what might feedback in the process or recycled elsewhere. It can involve thinking about what might be left behind and what use that might be. Using the proposition that these platforms can be interpreted as 'ecosystems' - imagined by initiators to be sustainable, outgoing and ongoing developments - it makes conceptual connections with the natural and social ecologies in New Plymouth's popular and historic public. Contained images can be found here. Jacobs, J. (2000), The Nature of Economies. Random House, New York, USA. “Broadly speaking the aims are to make better materials than we manufacture now, but to make them, a life-friendly temperatures and without toxic ingredients, like the filaments spiders make or the shell material abalones construct, for instance. “Biomimicry is a form of economic development. So caring about biomimicry requires caring about economic development – hoping that it continues vigourously. Otherwise, we can't hope for better products and safer methods. How else can we get them? “Thinking about development has made me realise how similar economies and ecosystems are. Thats to say the principles at work in the two are identical. 6. evolution of the interrelationships described. Ecologists regard ecosystems as basic structural units, implying that the biosphere is a collection or mosaic of definable ecosystems. 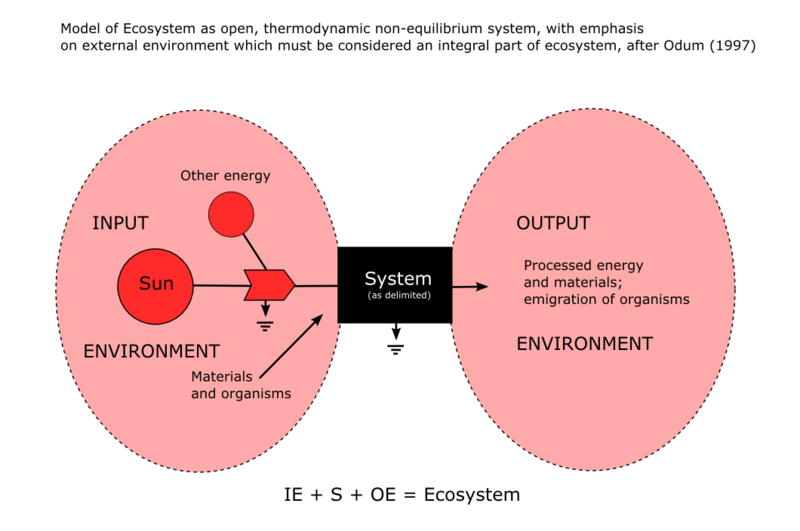 However, an ecosystem is really more conceptual than actual. By this we mean that the definable boundaries of an ecosystem are more in the mind of the ecologist than geographical. Gaia Theory: Consider that ecosystems are not, in most cases, isolated units, but parts of a larger functioning whole, at its broadest being the biosphere. Is it possible that biosphere—all life on earth and at least those physical things utilized and modified by life on earth—is one, large integrated system? The most basic interest of ecologists is how organisms interact with their environment. Inanimate objects do not normally "interact"—they are simply acted upon by forces in the environment. Organisms, however, cannot be totally passive within a chain of events and still sustain life. Living systems—organisms—respond in various ways to contacts with the physical forces of an ever-changing environment and interrelationships with other living organisms. The hereditary potentialities of an organism determine what it can do, but the environment determines what it actually does and to what degree (Greulach & Adams, 1962). This theme is important and you will see it repeated in the discussions that follow. Although these are more or less distinct categories and will be discussed in detail in this chapter, an organism's response to an environmental challenge seldom involves just one of these. An ecosystem is a biotic community with abiotic components consisting of plants, animals, and micro-organisms in an area functioning together with all the non-living physical factors of the environment. As previously mentioned, ecosystems contain bitoic factors and abiotic factors. The biotc factors are the living components of the environment. The abiotic factors are the non-living components of the environment. The idea of the ecosystem relates to the idea that all organisms in the environment are engaged in relationships with every other aspect (like resources and other organisms) in that environment. 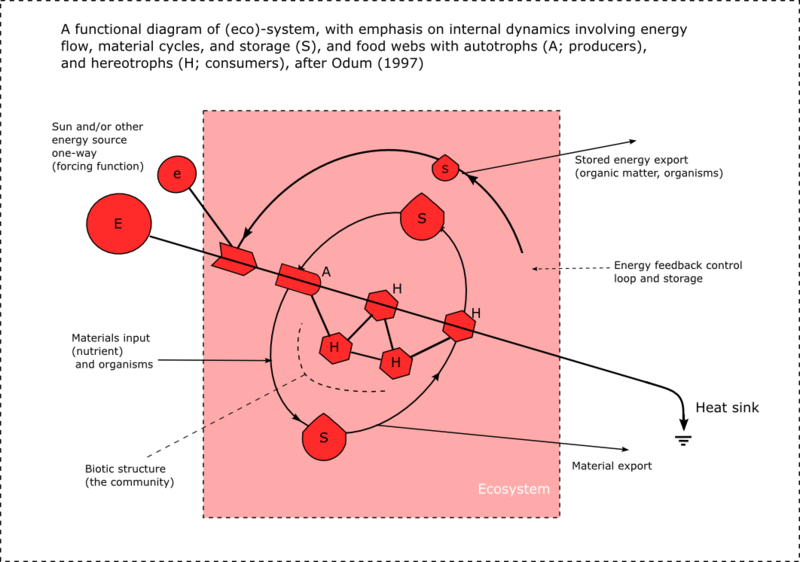 Ecosystems deal with energy and nutrient flow through a system/community. For example, a household or a university could be described as an ecosystem, and a city or a state could be described as a larger ecosystem. While ecosystems may be bound and individually discussed, they do not exist independently, but interact in a complex web. The ecological relationships connecting all ecosystems make up the biosphere. Because virtually no surface on the Earth is free of human contact, all ecosystems can be accurately classified as human ecosystems. Ecosystems vary in diversity. Some ecosystems may be very diverse with many plants and animals; whereas other ecosytems may be less diverse with less animals and plants in the environment. For example, the tropical rain forests could be classified as an ecosytem that has a high diversity; whereas the temperate rain forests could be classified as an ecosystem that has a lower diversity than the tropical rain forest.